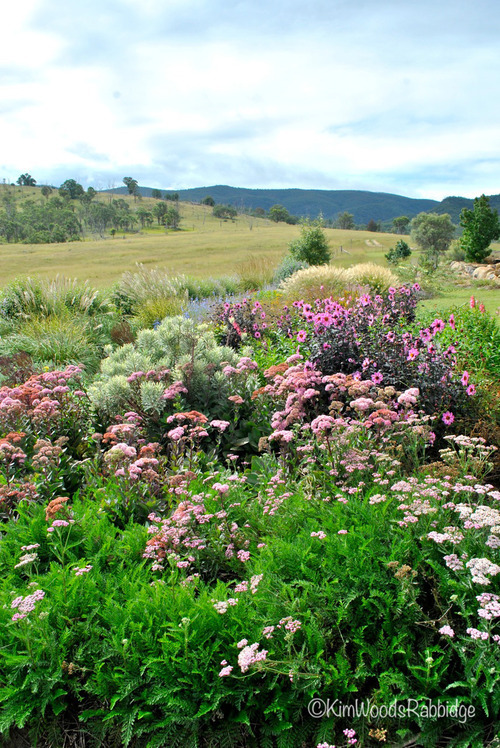 Designer Profile: Carolyn Robinson’s new garden ‘Eagles’ Bluff’. 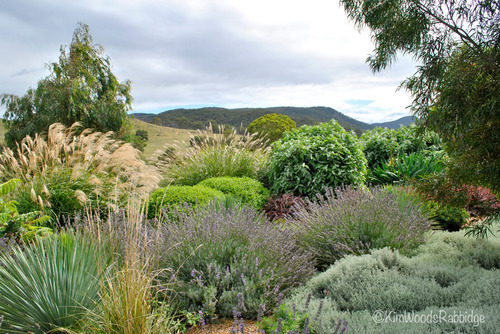 A few weeks ago we showed you Carolyn Robinson‘s original garden, Glenrock with a promise to soon share images of her latest project – ‘Eagles Bluff’ – well here it is! Carolyn has played with shapes and colour with her usual panache. Limonium perezii makes a vivid splash in the gravel mulch. 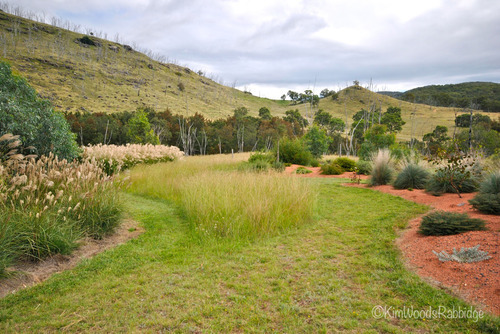 To access Peter and Carolyn’s new garden we drove along a gravel road meandering by the Bluff River (slightly wild after recent rain) in an area that’s rugged and beautiful. 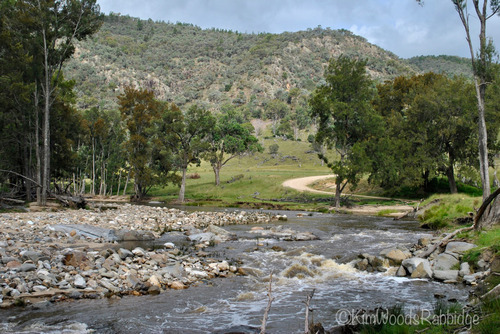 The river tumbles westward down the Great Dividing Range, just south of Tenterfield, and merges further on with Mole River as part of the Murray-Darling River catchment. 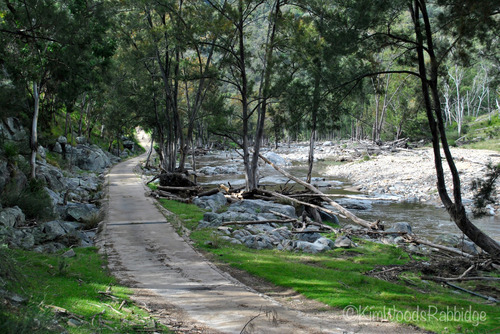 To one side, eucalypt woodland and green rainforest gullies remain pristine while on the other side, the land was cleared long ago for grazing. 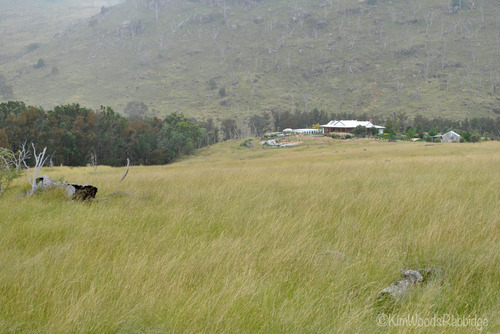 On the day we visited it began to rain and as we came across the home in the distance, on a rise above a bend in the river, we could only imagine the lively colours and rich textures we were soon to discover at Eagles’ Bluff. To the south of their newly built home a stark hill with remnants of ringbarked forest makes perfect habitat for majestic eagles. 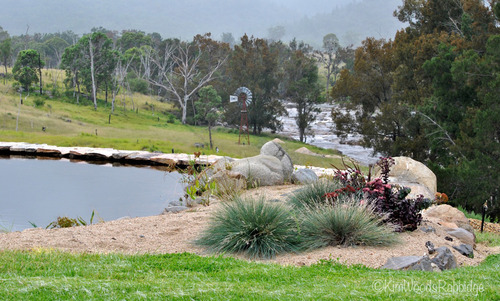 The Robinsons had been instantly drawn to this protected valley with stunning mountain and river views. 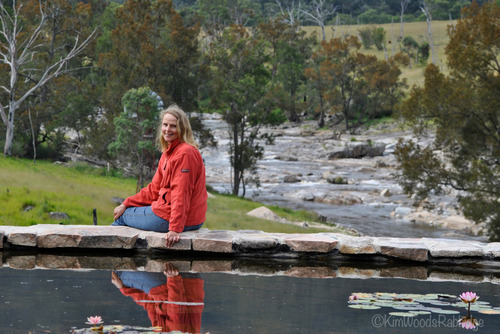 Both the Bluff River and the casuarina trees growing along its banks provide seasonal colour and interest, adding further layers to the plant combinations for which Carolyn is famed. Carolyn says she is taking her time to make this garden. The results are astoundingly mature given she works between this garden and Glenrock, as well as her (soon-to-be-launched online) Blue Hills nursery, and garden design practice. 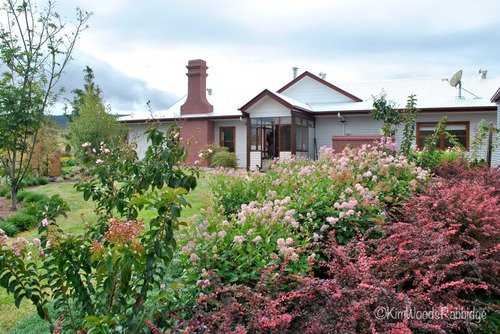 Most of the garden is less than two years old, but the house already appears settled into the landscape. 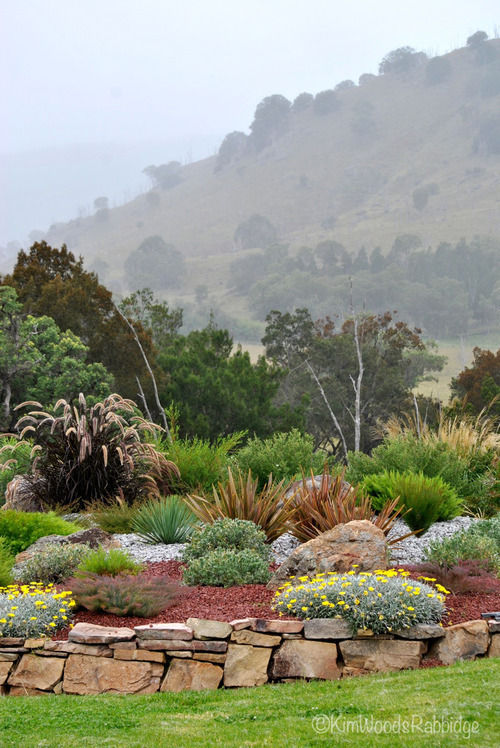 Carolyn’s signature dry-stacked rock walls, and the red rock mulch provide a warm environment for mounds of bright yellow Gazania ‘Treso’. 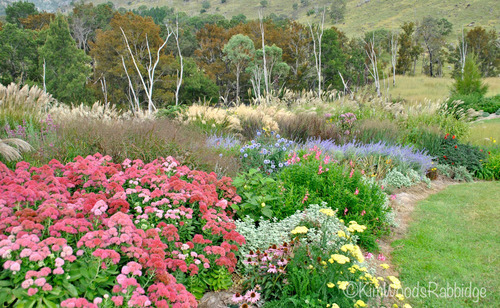 Low growing Homoranthus decumbrens and Convolvulus cneorum are the foreground to the rust coloured accents of New Zealand flax, Phomium ‘Maori Maiden’, which echo riverside casuarinas. 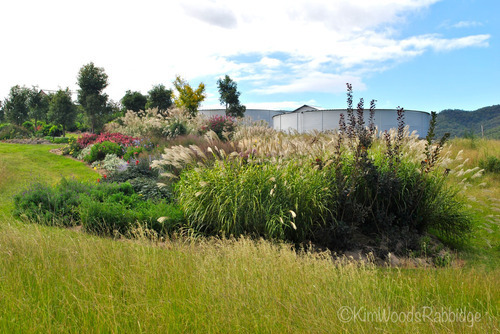 Pennisetum advena ‘Rubrum’ colours deeply in full sun and contrasts with the fresh green of Acacia cognata. 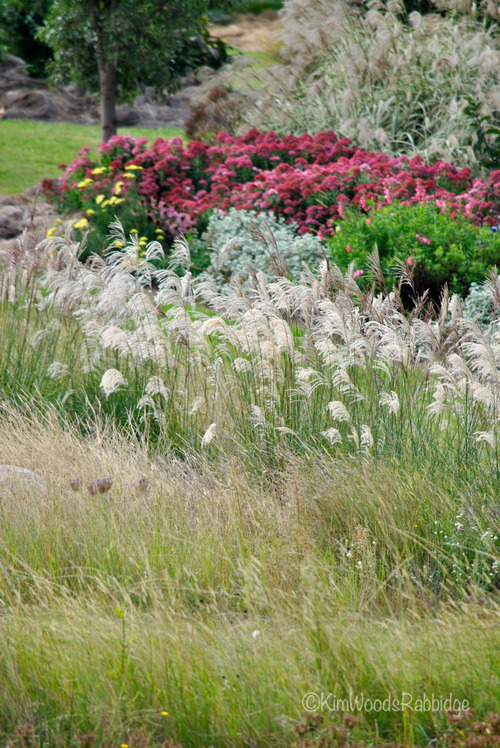 Rosemarinus postrate lies in front of vertical Miscanthus ‘Yaku Jima’. ‘Purple Emperor’sedums thrive in the warmth of gravel. 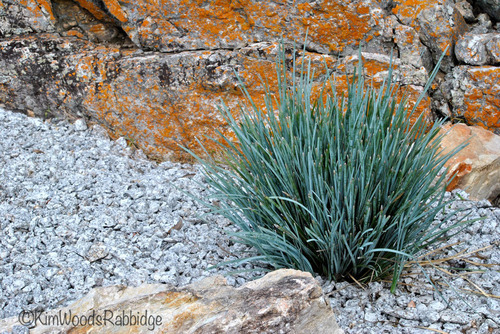 Poa sieboldiana provides the textural and colour contrast. The entry is highlighted by Ceanothus ‘Marie Simon’ and Berberis ‘Rose Glow’. 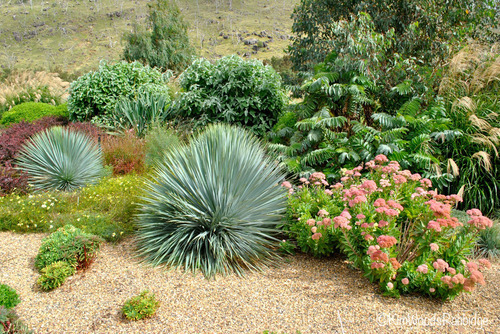 A trunked, silver green Yucca rostrata ‘Sapphire Skies’ sits with Sedum spectabile ‘Autumn Joy’, while the deeply-lobed South African Melianthus major fills the mid ground in this bed. Borders are Carolyn’s forte. 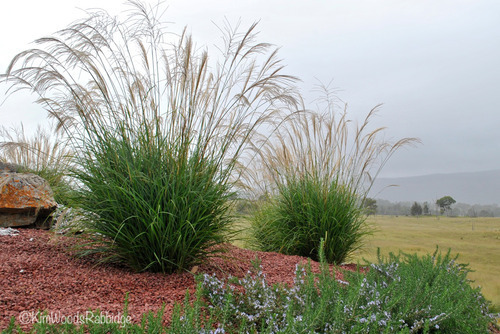 Swirling bands of texture and colour, in both foliage and flowers, are anchored by grasses. In the foreground is sea kale, Crambe maritime, and the bright yellow perennial Helenium ‘July Sun’. 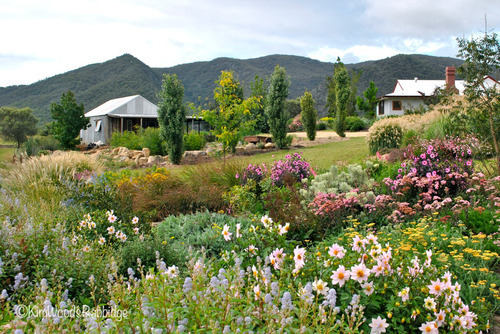 Blue-green and sometimes glaucous colours of distant mountains are echoed in the garden. Pink achillea with Sedum spectabile ‘Matrona’. Carolyn points out that as this is not a Mediterranean climate, perennials, which don’t enjoy long dry spells, are loving it here. 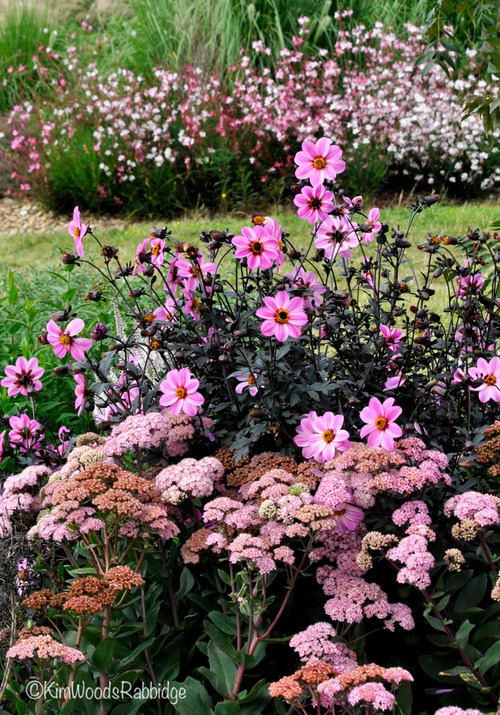 A happy combination evolved when her paintbox opened at pink: spilling Gaura lindheimeri ‘Pink Cloud’, a single dahlia and sedum. On this open site Carolyn’s been experimenting with long-flowering perennials without problems of shade or competition from tree roots. As well as adding a sculptural element, bands of unmown grass host tiny natives like the helichrysum, hibbertia and bluebells. 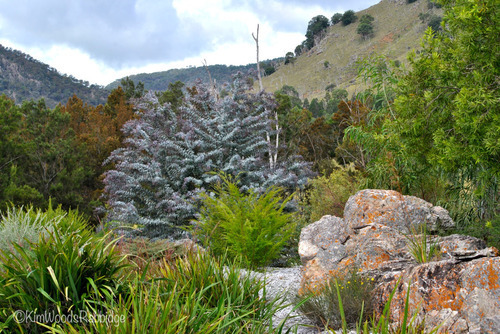 In ‘borrowed landscape’ beyond the garden, the reddish brown hue of flowering casuarina is striking. 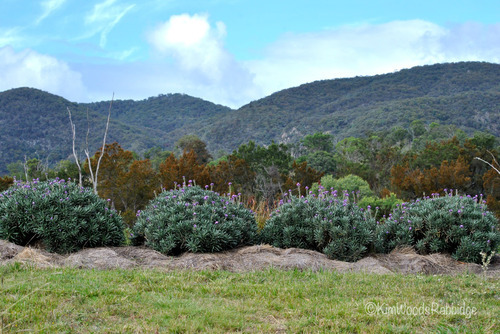 It’s a colour repeated in rocks and plants and provides a contrast, in this instance, with wallflowers Erysimum ‘Bowles Mauve’ lined up atop the dam wall. A bonus as interest in the garden, naturally occurring rocks lend solidity to the garden framework. 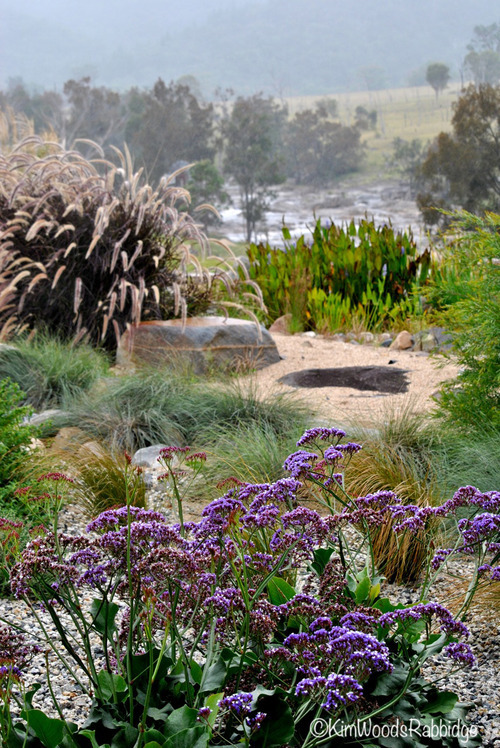 Tenterfield granite mulch, 10 to 15mm in size, highlights the glaucous Lomandra ‘Blue Ridge’. 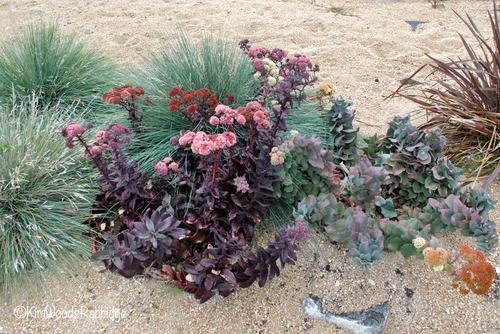 The granite mulch has been very successful in reducing weeds and providing warmth and colour to the planting schemes. 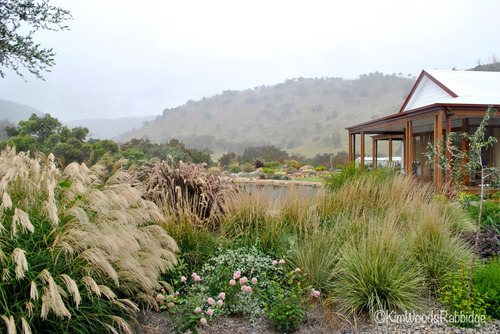 Massive water tanks help drought-proof the garden. 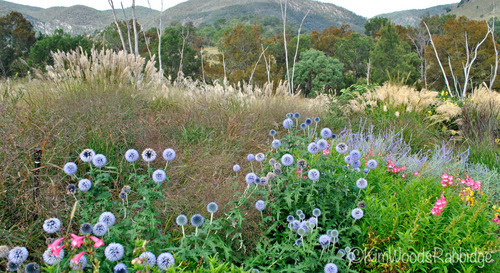 Small globe thistle Echinops ritro ‘Veitch’s Blue’ provides true blue, long lasting accents of colour. 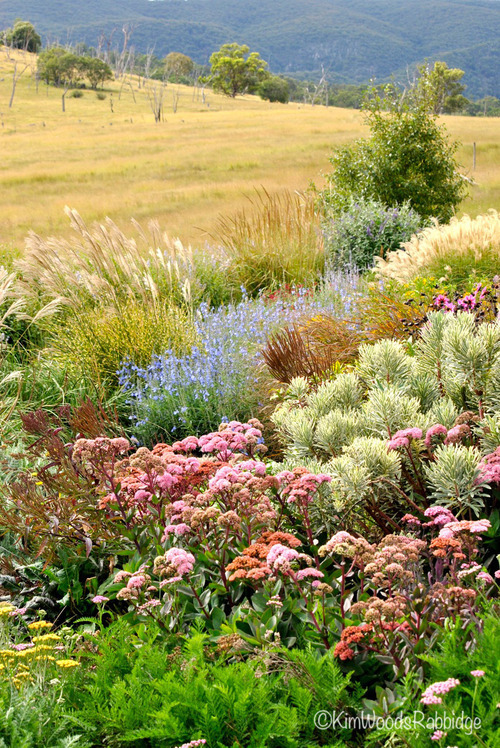 Deep borders amassed with grasses and sedums reflect a designer comfortable with her medium; ready to appreciate existing beauty, but bold enough to play with new possibilities. Stunning. I’ve observed Carolyn’s journey as a gardener over many years. 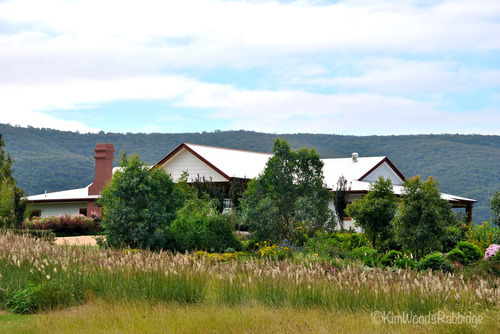 The way Eagles’ Bluff settles so imaginatively into its landscape is surely the culmination of keen observation, outstanding talent and much hard work. 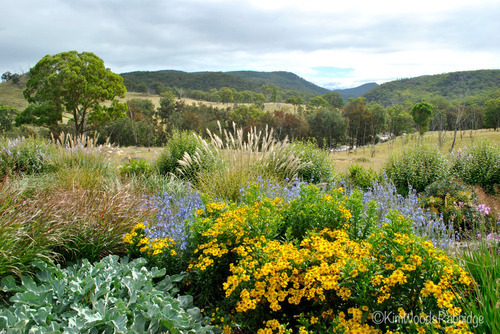 Eagles’ Bluff….I love the way that even though the plantings are exotic they blend in and complement the beautiful borrowed landscape. Thanks Kim- so wonderful to see Carolyn’s new garden!